We suffer from “Winter Amnesia.” Many have forgotten what adjustments are needed for safe winter driving. Go to Winter Driving tab. 2017 second consecutive year over 40,000 crash deaths. Increase in pedestrians, motorcyclists and young drivers killed. Many autopsies reveal concomitant use of opiods, alcohol &/or marijuana Use of cocaine, methamphetamine, and marijuana surging according to national survey in WSJ (5/9). About half of those killed not wearing seat belts. Not-so-smart phones major problem, Too may of us have become addicted to cell phones. Crash every 8 seconds; death every 15 minutes. Michigan more crash deaths than New York. By design, we are being held captive by Facebook, Google, Apple, Microsoft, Twitter, etc. We need to throw off these shackles and go back to traditional forms of communication like face-to-face discussions. 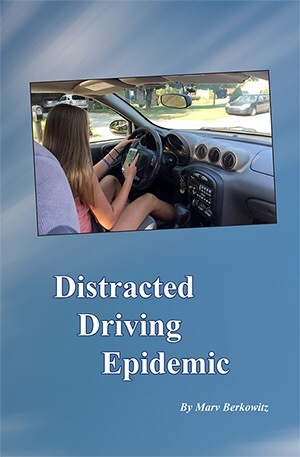 For new & old drivers, distracted driving has reached an epidemic level on our roads and highways. This book provides a comprehensive overview with some ideas to help solve the problem. It would make an ideal gift for any new driver or Smartphone addict in the family. For more information, click the link below. Recently we were invited to appear on a local informational/ events show to help spread our message. We had a great time & were well received. To see the interview follow the link. We are having a Winter fundraiser! Crash rates double in Winter.In 2018 we have reached audiences of about 1400 drivers from teens thru seniors. Three TV interviews –Presented 3 times at new WMU Med School, 2 Kiwanis Clubs, WMU OLLI for 50+ drivers and several high schools. Please help us continue our mission and also to expand our activities. Please donate and don’t forget, all donations are tax deductible. We were recently hosted by Orrin B. Hayes and the Mercedes Benz Club of West Michigan as the designated charity for the 13th Annual Fun Concours. During the event we had 26 people sign the pledge to not text while driving. We also received a number of donations to support our cause. Thanks to everyone who took the pledge and for the donations.